Many .Net developers use to say “if you’re a serious developer, then you MUST Reflector”. I would like to add another statement: “if you want to have an insight and powerful look at how things works internally, use Reflector Professional”. 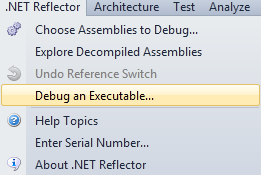 Last Wednesday, RedGate released a new version of Reflector. You’re probably going to download it soon or later because your actual version is going to expire. When you’ll download the free version, you’ll automatically get a trial (14 days) of the professional edition. Nice, but what’s so special about this edition ? 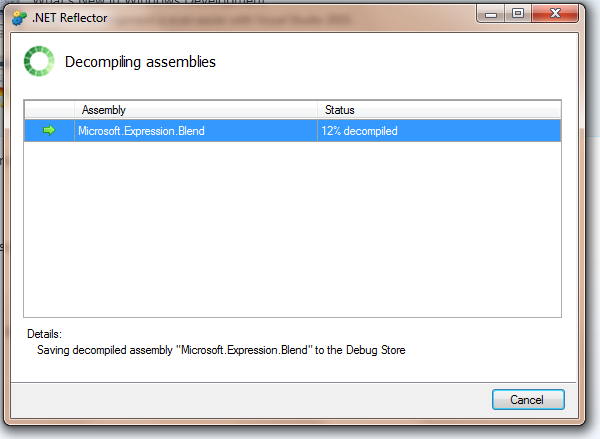 Step through decompiled assemblies and use all the debugging techniques you would use on your own code. 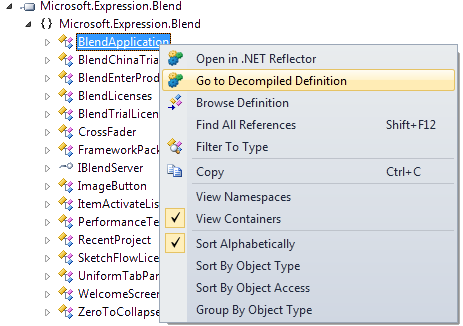 This is incredibly powerful as we saw by debugging Blend3″s source code ! I’ve already blogged about R# a couple of times. There is no doubt: it’s a must have for any serious .Net developper. A few weeks ago I learned and setup new shortcuts to improve my navigation skills in Visual Studio. A search box opens and I can start searching instantaneously.